low monthly subscription payment of $9.99 per month! Click here to purchase for $9.99/month! Learn the Skills You Need to Play the Music You Love! • The 99 Decisions Guitar Course: This collection of 99 individual video lessons has been designed to take you from a complete beginner to a fully-functioning guitar player. Ranging from two to eighteen minutes long, each lesson represents a choice on your part to apply yourself towards the goal of learning to play music... while having fun! These focused & concise videos cover all the musicianship skills that you need to play the music that you love in any style or genre. Each video is a complete, self-contained lesson, making it easy to fit learning to play the guitar into your busy schedule. The course is self-paced. You move on to the next lesson when you feel you are ready. You can also work on more than one lesson at a time, or skip around. Using large & easy to read graphics, each lesson's diagrams appears on-screen as it is taught. And the PDF booklet included with the program makes it easy to review the material anytime, anywhere. The 99 Decisions Guitar Program isn't just for beginners. Experienced guitar players can expand their musicianship skills & increase their knowledge by focusing on lessons covering the specific areas that they need to improve. There is a concordance & index that will help you create your own personal guitar agenda. • Bonus Lessons: The bonus lessons complement the 99 Decision Guitar Course. They're designed to broaden & deepen your musicianship skills, taking your guitar playing to the next level. Each extensive bonus lesson focuses on a specific topic: advanced chord technique, building rhythm skills, beyond the basic chords & ways to play scales. Soon, you'll be sounding like the guitar players you admire. The program currently includes four in-depth bonus lessons. The bonus lessons range from 40 minutes to over an hour. More will be added regularly. • Etudes: The best way to become an accomplished guitarist is to learn complete songs. Apply the techniques & vocabulary you have learned in the 99 Decision Guitar Program with a series of original etudes, designed to accelerate your growth in becoming a functioning musician. Start with the five Etudes- Strumming Etude, Barre Chord Etude, Blues Etude, Fingerpicking Etude & Pop Etude. More will be added regularly. • The Fulfillment Factor: Progressing on the guitar is about more than just getting your finger on the correct string & fret, or strumming the correct pattern. It is about the integration of Mind, Body & Spirit. The Fulfillment Factor video discussions address subjects critical to becoming a well-rounded & confident musician. Topics include maintaining an effective attitude, staying goal oriented, keeping your body relaxed, building hand & finger strength, stretching, staying positive & motivated and more. The program includes seven video discussions with more to be added regularly. There is also the 99 Decisions Blog, where Matthew addresses all subjects pertaining to exploring the path of learning to play the guitar. This course and the additional lesson & materials are based on a time-honored effective principle- learn the fundamental musicianship skills in a comprehensive manner right away so that you are set for life in your musical endeavors. Play the music you love, sooner! Just two hours into the 99 Decisions Guitar Program, you will know enough chords & strumming techniques to work on the songs you want to learn. Most online guitar courses present so much material that it becomes overwhelming. The 99 Decisions Guitar Program breaks it all down into digestible, approachable steps so you can proceed at your own pace. 99 Decisions is perfect for filling in any missing musicianship skills you need to learn. Or, you might want to take your current technique & knowledge to the next level. Whatever your goal, the 99 Decisions Guitar Program will help you achieve it. Create your own personalized curriculum. 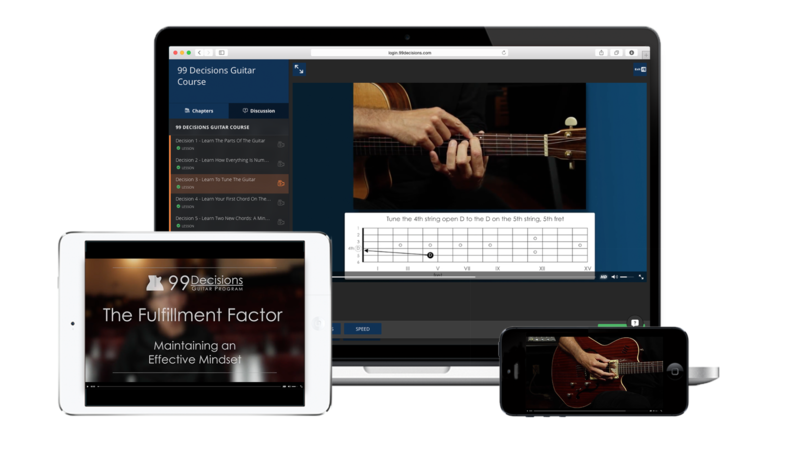 The 99 Decisions Guitar Program has an integrated index that lets you find which lessons cover the specific skills you want to focus on so that you can customize the program to fit your own personal goals. Or start with the first lesson and go in sequence all the way through! Online learning is effective... when it's organized! Most online guitar courses present so much material that it becomes overwhelming. The 99 Decisions Guitar Program presents digestible, approachable steps to learning to play so you can stay organized and effective. With 24/7 access on all devices, you can easily learn & review anytime, anywhere. The 99 Decisions Guitar Program is completely organized so you can master the material at your own pace and accelerate your progress on the path to becoming a fully functioning guitar player. Discover your own sound on the guitar & create your own music. Once you've learned the basic components of music with the 99 Decisions Guitar Program, you can explore your own ideas in the same way your favorite artists do, by combining chords & rhythms & melodies to make your own unique music… your own personal artistic expressions! Matthew Von Doran is an artist, musician & educator with a vast background in the music industry. He has a strong passion for teaching guitar & is dedicated to helping students learn to play music while enjoying the process. He has been assisting people achieve their musical goals for over three decades. Matthew has created hundreds of personal individualized curriculums for students seeking to grow as musicians & guitarists. He also helps people develop their success skills- mental focus, goal clarification, time management, total body awareness, effective mindset & cognition. The 99 Decisions Guitar Program represents a lifetime of enthusiasm & experience manifested into a course that is comprehensive, yet streamlined... teaching the skills you need to play the music you love. "Learning music is not just about the guitar, it involves strengthening intuition, building confidence, and finding the center of your passion." James Genus, Terri Lyne Carrington, Bob Sheppard, Marcus Baylor & more. Decision 54 - Learn the "Percussive Muted Strum"